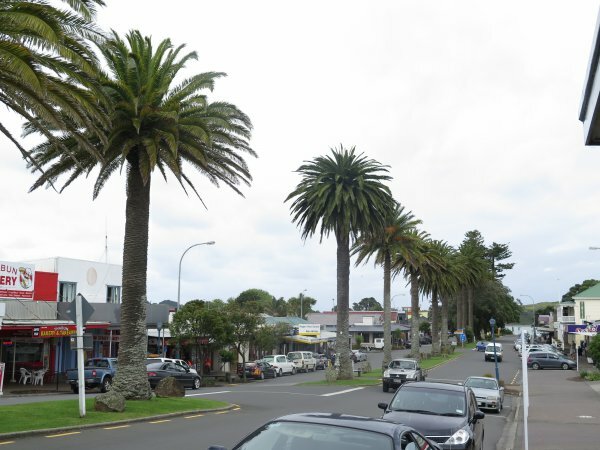 This avenue of Phoenix palms were planted following the 1922 visit by Lord Jellicoe (New Zealand's Governor-General at the time) and Lady Jellicoe when they visited the township to unveiled the First World War memorial located on the main street. The streets had been dressed with bunting and greenery for the visit and Lady Jellicoe asked if the plantings were permanent, to which it was responded that they were. At the very next town meeting this was acted upon and Phoenix palms were subsequently chosen. Several pohutukawa were also planted at the time but many have since been removed. The head of one of the Phoenix palms failed in strong winds on 28 April 2014. The palms range in size from 10m to 15.2m (McCathie, P. 2014). 2) Raglan District Museum, Bow Street Palms. See a number of historic images of the palms taken over the years including an image of the unveiling of the war memorial. 3) Waikato District Council. Gordon Bailey pers.comm. email 6 Jan 2015. Good although one has fallen over. 11 Dec 2014 McCathie, P.